This is our fourth and final installment in this series: Biblical Christianity vs. Traditional Christianity. In order to understand this episode in this series, you will need to have read and digested the first three. Here are the links to the previous 3 parts to this series: Part 1, Part 2, and Part 3. God doesn’t want us to forget that He worked, in Christ (in the Messiah), via the Holy Spirit, through the Apostles to expose another fallacy – The Judaizers. During the time of Paul, the apostle, there was a group of Jewish believers in Yeshua, of the background of the Pharisees, that followed Paul’s church planting routes, and attempting to corrupt those new, mostly Gentile, churches that were recently planted by Paul and/or Paul’s team, etc. Those Judaizers attempted to intimidate, with highly persuasive speech, those Gentiles to convert to Judaism in all facets of their lives – either in order to be saved – or – after they were saved by Jesus (born again). They wanted those Gentiles to “follow the Law of Moses” along with “following Jesus” (or Yeshua). They would say that these Gentiles “must OBEY the LAW of Moses” in order to be saved – and/or – “they must OBEY all of the Law of Moses” in order to follow Jesus Christ (Yeshua h’Mashiach), etc. And, in some cases, as with many of the Gentile churches of the region of Galatia – they were successful, in some degree. And that is why Paul wrote the Book of Galatians, to combat that false teaching that corrupted the Gospel (read the book of Galatians). Thankfully, we have the record of this in Acts 15:1-35. The Council of Elders, Apostles and church leaders met in Jerusalem to examine these claims – that Gentiles coming to faith in Jesus Christ – “must be circumcised and OBEY all the LAW of Moses” in order to be saved or to maintain their salvational relationship with God in Christ Jesus, etc. Please, read Acts 15:1-35 in its entirety, and notice the verbiage of the Letter that was sent to the Gentile churches in Acts 15:23-39 – you’ll see there is nothing laid upon the new Gentile believers that would seem, in any way, force Gentiles to observe anything within the Law of Moses, at all. You must understand, that those Gentile churches in Galatia (region – see the book of Galatians) and in region around Antioch, only had that Letter to read – the text of the letter is in Acts 15:23-39. You would be hard-pressed to find anything in the text of that Letter that would even give a hint that Gentiles, in Christ, needed to follow any of the Law of Moses – observe the Sabbath, Tithe, Circumcision, etc. They were free to follow Jesus Christ, within the context of the New Covenant, while being sensitive to the Jews still living around them (the restrictions regarding “things strangled, eating things with blood”, etc.). While it is clear, beyond any shadow of any doubt, the new Gentile believers in Jesus Christ were to avoid, reject, and renounce all idolatry and paganism, they were also NOT being forced to become Jews (e.g. : observe the Sabbath, pay tithes, give offerings or sacrifices in the Temple, and if you are male – get circumcised, etc. – or to observe any of the other 613 Laws of Moses to Israel, by God in that specific Covenant), etc. That Letter put the nail in the coffin of the Judaizers’ False Doctrine that corrupted the Gospel of Christ (again, please, read the book of Galatians). In today’s world – The Judaizers are ALIVE and WELL – repackaged in the various Hebrew Roots Movements and/or Messianic Judaism Movements, and the like, that you can find on the internet, today. Again, as I’ve said from the pulpit many times, we, as Biblical Christians must and should know our Hebrew Roots – there would be no Biblical Christianity without the Old Testament. 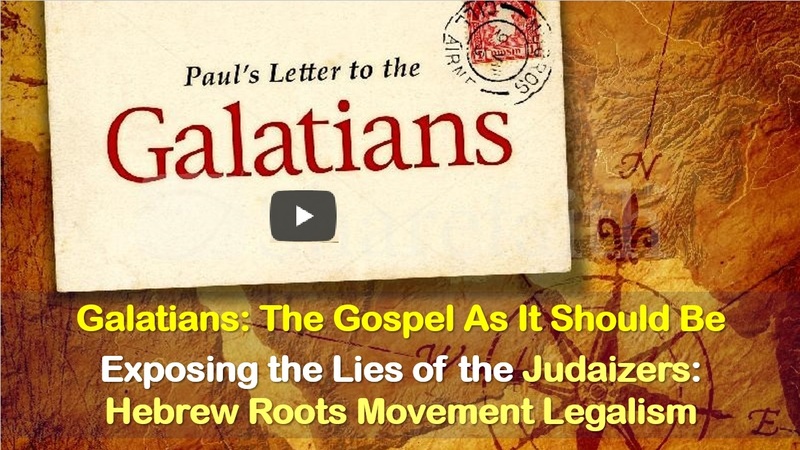 But to go head-long into any of these Movements and then become a legalist – is no different than the heresy and false doctrines that the apostle Paul (Rabbi Shaul) faced in his day with the Judaizers (again, read the book of Galatians). It is the same set of false doctrines repackaged for “today’s world” with no difference in essential essence, etc. 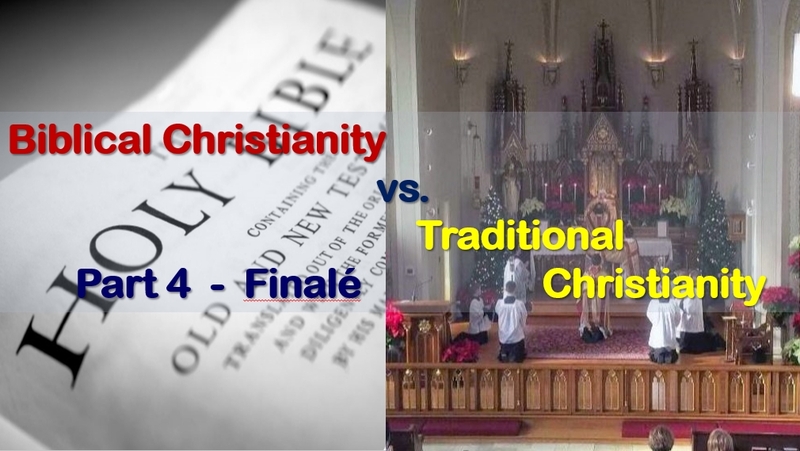 Today, the scenario plays out like this – a born again Christian, finds out that many of the non-Biblical, post-Biblical, so-called Christian traditions, celebrations, practices, rituals, and yearly “holidays”, etc. are Roman Catholic. And, then, he or she finds out that all those traditions, celebrations, practices, rituals, and yearly “holidays” all have pagan roots. They were all fully idolatrous and pagan in their origin and the Roman Catholic church “Christianized” those pagan things, etc. Then, that born again Christian stops participating in those things – or at least attempts to. In the process he or she finds out or “stumbles upon” some new Hebrew Roots ministry and, “coincidentally” that ministry is also exposing those pagan things of Roman Catholicism. With very slick, highly persuasive speech he or she is convinced to follow this Hebrew Roots Messianic Judaism as a Replacement of those things he or she used to participate in. Then, as time goes by, he or she is convinced that other born again Christians MUST or SHOULD follow all the Law of Moses, as he or she is doing, now … thus, he or she has become a Judaizer, a Hebrew Roots Movement Legalist – just exactly as those that Paul faced during his day. Thus, the full Pendulum Swing of Extremes occurs and seems to be the normal tendency and pattern of folks realizing the pagan-roots of the many Roman Catholic traditions, etc. They go from one extreme to the other – from Roman Catholicism or Roman Catholic-Lite – to Hebrew Roots Legalism / Messianic Judaism Legalism. And they think they are correct in their new-found religious logic. This was also similar to what happened within the few churches in the region of Galatia during Paul’s time (read the book of Galatians). Those churches in Galatia – for a different reason and motivation came to the same conclusion after listening to some slick, highly persuasive speech about their need to OBEY the Law of Moses in order to become good Christians or good Followers of Yeshua, etc. Thus, God wants us to understand His Word, which is based upon what Covenant of God is in force, and the 3 P’s. Each Covenant is a Framework of how we are to follow God and how God will both respond and bless or curse, etc. as the case may be. The Covenant of God with Abraham, Isaac, and Jacob – preceded the Mosaic Covenant of God to the nation of Israel. It is very important to understand that The Abrahamic Covenant (i.e. : The Covenant of God with Abraham, Isaac, and Jacob) is eternal and unconditional. It was partially individualistic and partially generational. It was partially related to Land and partially related to Blessing all Nations through Israel. The Blessing part – is what we are a part of – in Christ, in the Gospel of Christ. We see this revealed well in Romans 2 thru 4 and in Galatians 1 thru 5. That part of the Abrahamic Covenant – has an Extension attached to it -> The New Covenant in the Messiah of Israel, the Savior of the World – Jesus Christ (Yeshua h’Mashiach). In the New Covenant – we find in the book of Hebrews chapters 5 thru 10 and in Jeremiah 31:31-33 – it is NOT LIKE the Mosaic Covenant – it is a New Covenant – which will include Israelis and Gentiles, alike, in a New Body (see Romans 1:16; Ephesians 2:11-22; Romans 11:1-36). And this is where the Hebrew Roots Movement Legalists get things wrong – we, Gentiles are NOT Grafted in along side or within Israel – be we are GRAFTED IN at the point of Isaac. We are grafted in as sons or children of Abraham – not great, great, great grandchildren. Galatians 3 is very precise in its choice of words used. We are grafted in BEFORE the Mosaic Covenant – at the point of living in the Tents with Abraham, Isaac, and Jacob – in a Personal Relationship with God – in Covenant Relationship. We must understand, now, that we are in the New Covenant in Christ. Over and over again, we find that this New Covenant in Christ is NOT LIKE the Mosaic Covenant – at all. It is Brand New – in the Messiah of Israel. It is NOT a Modified Mosaic Covenant in which we must do certain rituals, fulfill certain obligations, pay tithes and offerings, keep the sabbath, be circumcised, go to the Temple, etc. That was the way it was under the Law of Moses. But we are NO LONGER under the Law of Moses (again, read the book of Galatians). Galatians 5:18 is very clear regarding this: “But if you are led by the Spirit, you are NOT under the Law.” Thus, if you are NOT led by the Spirit – you ARE under the Law. Which is it going to be? Folks balk at this and say that we MUST KEEP the SABBATH – didn’t Jesus Keep the Sabbath? What should we have learned for this investigation? We should have learned that God wants us to stick to His Word, alone, as we follow Christ, together, as the Body of Christ, and as local church families. SOLA SCRIPTURA – or Scripture ONLY – was the Loud Cry of the Protestant Reformation. Along with Embracing God’s Holy Word, alone – it also means that we must REJECT that which is false and Pretends to be “Christian”. We’ve seen that the Roman Catholic Church “Christianized” many idolatrous / pagan practices, beliefs, traditions, and celebrations and they are still embraced, supported, and propagated, today, as if they are really “Christian”. But the tragedy is, that many of those “churches” that have their origins in the Protestant Reformation are now more than ever, embracing more and more of these Roman Catholic, post-biblical inventions as if they are, indeed, truly, Christian. Thus, we must Continue to Protest and Reject such pagan-rooted and man-made religious things that pretend to be Christian, but are plainly not. We are NOT obligated, forced to, nor do we have to follow various rituals, celebrations, feast days, etc. of the Law of Moses in order to follow Jesus or to be saved by Jesus. The Judaizer Heresy of Paul’s day has been repackaged, today, as the Hebrew Roots Movement, the Messianic Judaism Movement, and other names like that. They are still pushing: that unless you are circumcised, keep the sabbath, and follow all the Law of Moses you cannot be saved or you cannot truly be living the Life our Messiah Yeshua wants you to. Anything short of that is sin, to them. We cannot avoid Acts 15, the book of Galatians and the book of Hebrews regarding what those related passage teach about this modern-day Judaizer Heresy. They all warn us about this heresy and tell us this – that we are No Longer under the Law of Moses (or under the Covenant of the Mosaic Law of Israel). Hebrews 8:13 says, “In that He says, “A New Covenant,” He has made the first obsolete. Now what is becoming obsolete and growing old is ready to vanish away.” -> You can’t get any clearer than that, no can you? We must follow God’s Word, following God in a Simply Biblical way – but it is NOT simpleton. We are to Simply Follow Jesus according to the Word of God, alone – and we cannot avoid some passages, such as those in in Acts 15, Galatians, and Hebrews to justify our modern-day Judaizer heresies we may hold. Neither should we embrace Roman Catholicism nor any pagan, worldly beliefs, traditions, celebrations and/or practices. Just because some Christian, or so-called Christian Pope “ordained” something, or Christianized some Pagan thing – doesn’t make it a “Christian thing”. We must, follow Jesus Christ, in the New Covenant, according to the Bible, alone – and not according to some Pope or the Law of Moses. We must be in the Simply Biblical, Sound Doctrinal Middle Ground of Biblical Christianity. local church family according to the Bible? The LORD’s Day – is it Sunday or Sabbath?